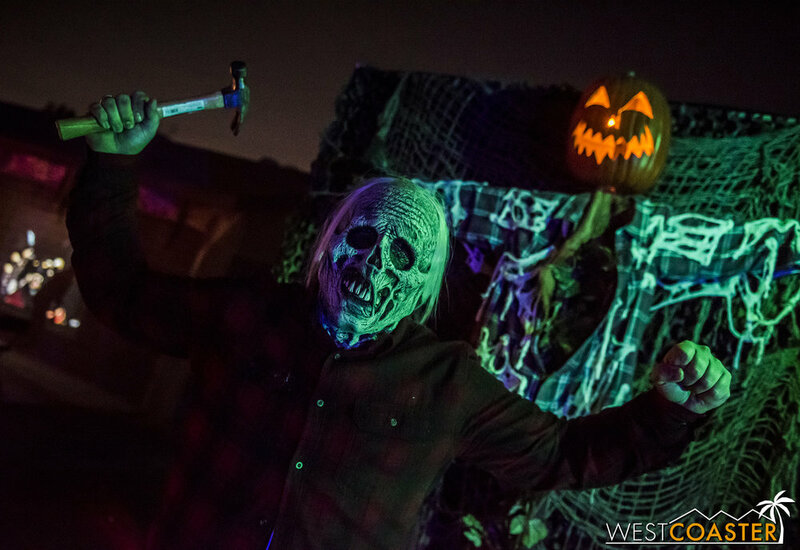 Well, we’ve come upon it: our last new home haunt review of the season. This won’t be the last home haunt review of the season period—we’re actually revising a review of a home haunt that we were invited back to that we have previously recapped, to see what changed over the course of a few days of its run. But for today, our last review of a home haunt we haven’t yet visited comes in the form of Hull House, a yard display in Buena Park that ended up becoming a bonus haunted house as well on the evening Westcoaster visited! The front yard of Hull House is beautifully done up. Hull House is one of the haunted attraction that has been given exposure by the invaluable SoCal Haunt List, which provides a directory of its own for haunted attractions around Southern California but primarily focuses on home haunts that might not otherwise have much other publicity. It is basically a moderately scaled, well done traditional yard display. There are worn away tomb stones, illuminated jack-o-lanterns with various expressions. A skeleton stands in the lawn, and another sits content on the roof eave. 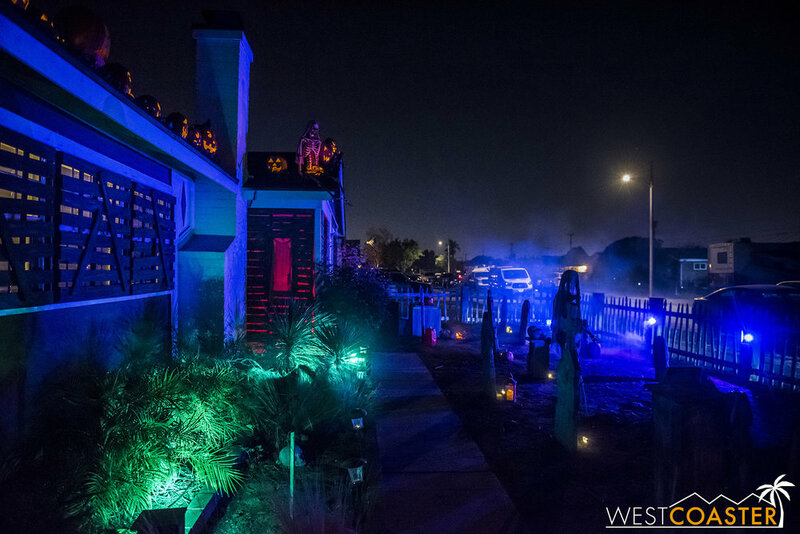 These are elements that can be found in many haunted yard displays, but the quality in this residential cemetery is impressively high, and the theatrical lighting really makes for a highly photogenic scene! Some cool figures and tomb stones, each personally made. But what does set Hull House apart is that it is a single-person job for everything—props, lighting, audio, wiring, and programming. Most haunts are a team in some capacity—and home haunts are often a family or family and friend affair. But Hull House is truly put together by a team of one. The picket fence, the aging on the tomb stones, the carving of each jack-o-lantern, and even the boarded up windows (made cleverly of a wood frame with painted foam strips made to look like wood to reduce weight) are all, ultimately, the result of crafting projects. 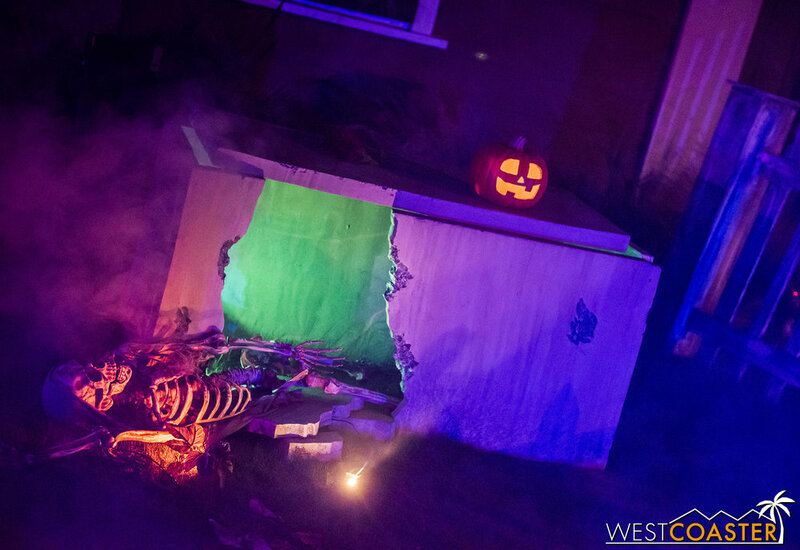 A little walk-through mini-haunt was thrown together for neighbors on Halloween night. During the final evenings of Hull House’s 2018 run, there was even a little mini-maze thrown together last minute. It really only consisted of four walls, some light theming and lights, and a few friends volunteering as monsters. But it served as a fun little bonus for the neighborhood children who passed by. When all is said and done, Hull House provided a great little home haunt that was good for a quick but meaningful stop to take in the details. It was a good add-on to a partial night trip to nearby Knott’s Scary Farm, and for those visiting on the last weekend of October, it would have made for a good partner with Twisted Dreams Haunt as well! 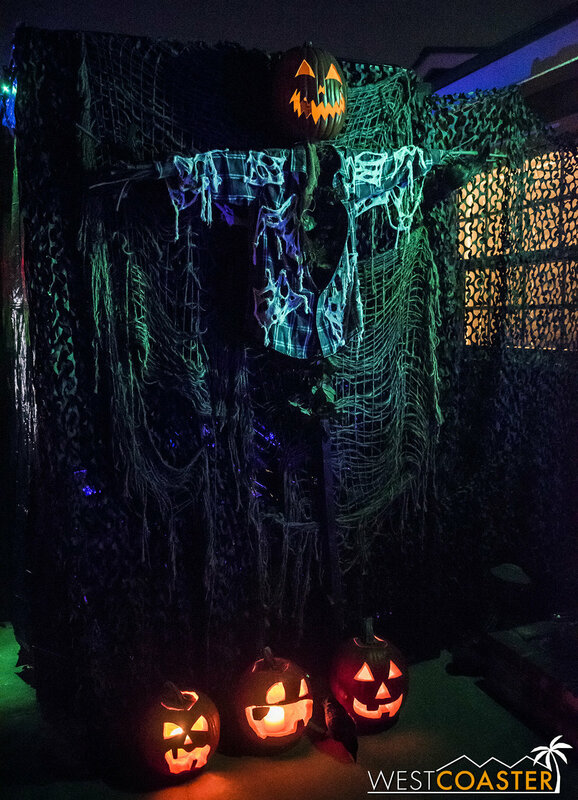 Hull House is located on 6688 San Alano Cir, Buena Park, CA 90620 and operated nightly from Saturday, October 13 through Halloween night, October 31 this past season. There are plans to go bigger and more elaborate next year, and if this was any indication, the haunt has a promising future ahead of it!